1. Which of the following is true regarding Ammeter and Voltmeter? 2.A resistance of 3Ω is connected in series with 5Ω. This connection is kept in parallel with a 8Ω resistance. 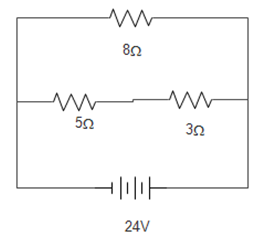 The current in 5Ω resistance if 24V potential difference is applied is? 3. Consider the previous case (Q12), if there is a switch in sereris with 8Ω resistance and the switch is open, Now the current through 5Ω is? 5. While wiring of electricity is done in your new home, how will you arrange the bulb and fan? 6. Which of the following can be used for making insulation over wire? 7. Which of the following is true about resistivity? 8. If 400J of heat is produced by a resistor of 4Ω in 4sec. Find potential difference across the resistor? 9. If a wire having resistivity ρ is cut in 4 pieces, the resistivity of each piece will be__________ if temperature has been kept constant. 10. What is work done in bringing positive 2 coloumb of charge from point A to B, given potential difference both points is 10V. Which of the following is true regarding Ammeter and Voltmeter? Since the voltmeter is connected in series with the required device, no current should pass through it to have exact calculation of potential difference. 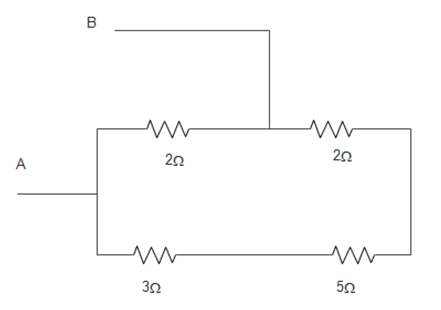 A resistance of 3Ω is connected in series with 5Ω. This connection is kept in parallel with a 8Ω resistance. The current in 5Ω resistance if 24V potential difference is applied is? Consider the previous case (Q12), if there is a switch in series with 8Ω resistance and the switch is open, Now the current through 5Ω is? While wiring of electricity is done in your new home, how will you arrange the bulb and fan? Appliances are connected in parallel. Which of the following can be used for making insulation over wire? Plastic is used to make switches as it is insulator, rest options are conductors. Which of the following is true about resistivity? All are truly said about resistivity. If 400J of heat is produced by a resistor of 4Ω in 4sec. Find potential difference across the resistor? If a wire having resistivity ρ is cut in 4 pieces, the resistivity of each piece will be__________ if temperature has been kept constant. The resistivity do not changes with change in shape. It is function of material and temperature. What is work done in bringing positive 2 coloumb of charge from point A to B, given potential difference both points is 10V.